Football Association chief executive Martin Glenn has revealed security advice was taken before agreeing England's warm-up match with Turkey. The teams last met in 2003 when the FA did not take their Istanbul ticket allocation due to crowd trouble fears. 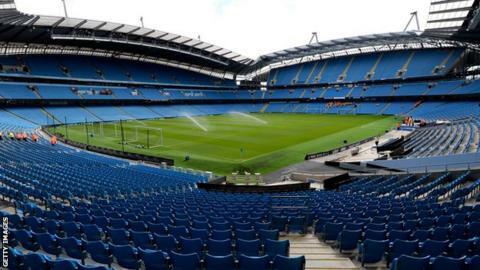 England will host Turkey at Manchester City's Etihad Stadium on Sunday, 22 May with the kick-off yet to be confirmed. "There is a risk assessment to it," Glenn admitted. "The timing of the kick-off will reflect that." He added: "We wanted the best possible opposition. You do that in consultation with the security people and police." Roy Hodgson's men will play three warm-up matches as part of their preparations for this summer's European Championship, which begin on 10 June. After the meeting with the Turks, Australia will visit Sunderland on Friday, 27 May and Portugal will be the guests at Wembley on Thursday, 2 June. Asked about the choice of venues for the matches, Glenn explained: "We wanted to create a tournament feel. We wanted the notion of travelling. "It became a commercial discussion. They were really keen to have us, with the training facilities." Hodgson had requested games away from Wembley and said: "I'm happy we have secured three challenging opponents." The Turkey game will take place the day after the FA Cup final, while the Australia match is a day before the Champions League final. Turkey and Portugal have both qualified for Euro 2016 along with England, who have been drawn alongside Wales, Russia and Slovakia for the tournament in France. Uefa rules previously allowed teams to play only one other Euro 2016 participant in the month before the tournament, and none from the same group. However, new regulations state two friendly matches can take place against other qualifiers, provided they are not in the same group.